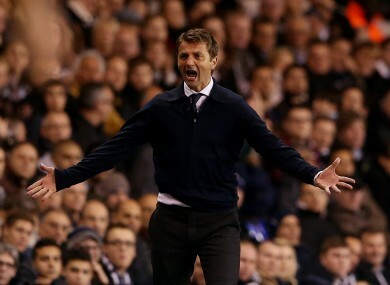 There was explanation for Tim Sherwood from our readers. IT’S BEEN ANOTHER busy week in the sporting world with the Masters getting underway, the European club rugby mess finally getting sorted and David Moyes’ reputation taking another dent. We’ve gathered together some of the sharpest, wittiest, strangest and most memorable comments from our beloved readers. Thank you for your contributions. Wayne Rooney returned to Man United training earlier in the week [even if it didn't look that way against Bayern], and the news was welcomed by Eddie Roche. Gordon D’Arcy explained the difficulties of trying to halt Toulon’s gigantic centre Mathieu Bastareaud, before StandOff10 summed it up succinctly. Adam Scott picked out a champions’ dinner before the Masters got underway, so we asked what you would choose if given the chance. John S came up with this wonderfully Irish menu. TV3′s Trevor Welch explained to us how he had come to hand a packet of custard creams to Jose Mourinho during a post-match interview, but Noel Howley was quick off the mark with this put-down. Brian O’Driscoll received some brilliant kicking advice to pass on to Joe Schimdt, Jonny Sexton and Paddy ‘Joe’ Jackson, presumably from a young fan. However, Eugene Carew suggested it came from a more familiar source. Incredibly, someone racked up a €4,100 bill in the merchandise tent at the Masters, but Dermot Fennelly was unimpressed. Luis Suarez and Steven Gerrard were both named Premier League Player of the Month for March, and Fran Heavy says a decision needed to be made one way or the other. Email “Custard creams, ROG's handwriting and Burkina Faso; It’s the week in comments”. Feedback on “Custard creams, ROG's handwriting and Burkina Faso; It’s the week in comments”.